Chinese experts are urging the government to support the growth of the country's natural gas industry by allowing more flexible pricing mechanism and encouraging private-sector involvement. The government will promote the establishment of a complete natural gas system including production, supplies, reserves and sales, according to a document released by the National Energy Administration (NEA) on Wednesday. He Lifeng, head of the National Development and Reform Commission (NDRC), also said that the government is coordinating efforts to promote this process, according to a statement posted on NDRC's website on Thursday. The moves come after natural gas shortages over the winter season left parts of China with little or no heating. He said that the shortages had exposed China's "systemic flaws" in the production and supply of natural gas. 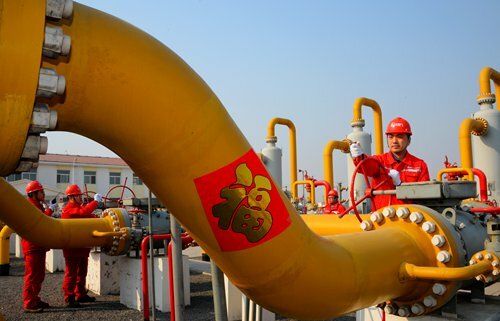 Sun Yang, a natural gas analyst at bulk commodity services provider chem365.net, told the Global Times on Thursday that the government aims to make natural gas trading more market-oriented. "In the past, the natural gas price was set by the government. But in recent years, the government has eased its controls by empowering major State-owned natural gas providers such as the China National Petroleum Corp [CNPC] to negotiate industrial natural gas prices with downstream companies. "Domestic companies were also allowed to bid for natural gas trade near the end of last year," Sun said. The CNPC hadn't responded to the Global Times' interview request as of press time. Sun said market-driven pricing of natural gas is a sign of reform in the natural gas industry, but that reform is limited compared with the oil market, where prices fluctuate more flexibly. Sun also said that the government would likely revise the policy of using revenue from industrial customers to subsidize residential prices. That might mean a slight increase in residential prices, but "it's going to be a very slow reform," she told the Global Times. Lin Boqiang, director of the China Center for Energy Economics Research at Xiamen University, said that the government should allow more private companies to engage in natural gas trade. "If major pipelines must be controlled by State-owned players, maybe branch pipelines can be left to private companies," Lin told the Global Times on Thursday. He said that the government can also offer incentives to private natural gas traders, which are at a disadvantage compared with the big players. According to the NEA, the government will designate natural gas-fired peaking power stations, which only operate when demand is high, and reduce natural gas costs. Sun said that increasing gas production in China is problematic because the nation's resources are limited and exploration techniques here are relatively underdeveloped. "The government is thinking of exploring unconventional forms of gas such as shale gas, as well as increasing imports, to solve the problem." The NDRC statement also noted that China will sign "closer and longer" natural gas supply contracts with countries like Russia. The NEA statement forecast that China will produce 160 billion cubic meters of natural gas in 2018. Lin said that compared with the exploration, production or purchase of natural gas, transportation is a tougher problem for China because the infrastructure for handling the fuel is lagging behind. "China needs to build more gas pipelines and reservoirs so that surplus gas in the summer can be stored to meet high demand during the heating season," Sun said. Shortages will likely be less severe during this coming winter, Sun said, because many local governments have halted the type of coal-to-gas conversion projects that contributed to shortfalls this year.